Railings are imperative in residential and commercial properties. From staircases to balconies, they are utilitarian but they also need to be aesthetically appealing. Gone are the days when railings would only act as safeguards and offer handrails for support. Railings of modern properties are just as elegant to look at as useful they are in serving the primary purpose. 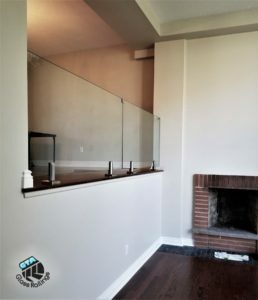 While they can be made of any sturdy material you choose, glass railings in particular can boost the property value in Toronto and GTA. Glass has a perennial and universal appeal. No matter what type of property it is and what kind of architecture you have, glass will in all likelihood be a natural choice. You would not have to compromise on any aesthetic aspect or element of design to go for glass. The natural aesthetic of transparent or translucent glass and even opaque glass is what makes it such a safe choice. Glass railings that are transparent will offer an impression of spaciousness. Even if a balcony is not very spacious, a deck is not larger than life or a staircase would only allow two people to be cramped sideways while going up or down, the glass railings will make the balcony, deck and staircase look larger than they actually are. Glass doesn’t induce the compact or cramped appearance or feel like opaque hard materials. Whether it is brick and mortar or concrete slabs, hardwood or any type of tile that you can think of. You will have a cramped appearance and that doesn’t augur well when there is already a sort of scarcity of space. Glass railings are durable, affordable and they can come in a myriad of designs. These certainly provide the grounds for a boost to the property value in Toronto and greater Toronto area. What also works in favor of glass and by extension in favor of the property owner is the fact that glass needs very little maintenance. Glass is easy to clean and it is more resistive to stains and even cobwebs or simple dust and dirt. Glass railings will also hold up their original splendor longer.